We are involved in offering a wide array of Disposable Plastic Gloves that are designed using the best quality basic material and progressive technology by our proficient professionals with the set industry standards. Moreover, these gloves are examined against different parameters under the guidance of quality examiners to ensure zero-defect deliveries. 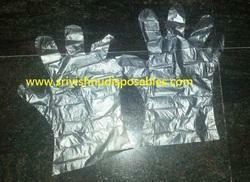 Widely used by the surgeons, these gloves are very comfortable and skin friendly in nature. Veterinary Gloves offered comprise high performance PE disposable gloves that comes developed using polyethylene material and is offered in sizes of M/L/XL. Further, these gloves are offered in transparent/colored finish and can also be developed in –HDPE material choices. Some of its features include sterilized/non sterilized finish; suitable for use in medical applications; disposable construction finish and others. 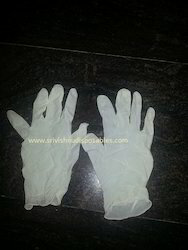 Our company has achieved laurels for providing Latex Surgical Gloves to the clients. These products helps protect your hands against body fluids, and also for clean up after patients and keep your work area sanitized. Latex Surgical Gloves are made using tested grade material and advance machine at our unit under the professional guidance and supervision. Offered range is highly appreciated by surgeons. These products are checked on various parameters of quality before delivering at clients' end. 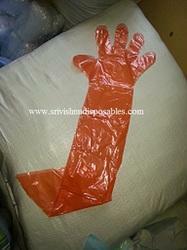 Looking for Disposable Hand Gloves ?